By far the most popular animal on the stage is the Cat. House cats are very diverse and you can create many variations of stripes and spots. The featured look is a Tiger Cat. For wild cats like a Lion, keep it to three colors (brown, white, black). For a Tiger (orange, black, white) and for a leopard use two colors (black and white) to apply spots instead of stripes. Be sure to click on highlighted products to view. Even out skin by applying foundation over face (including lips) and onto throat. Conceal under eyes to lighten dark circles. Mode Dion’s Foundation Kit has all you need for flawless looks. 2. 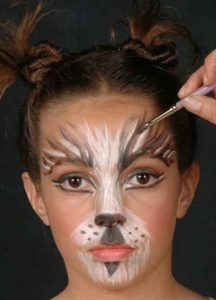 Highlight with white a pencil down center of nose, under brows, around upper lip (to create a muzzle), onto chin, and high on cheekbones. 3. 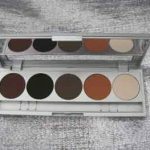 The Mode Dion 5 Color Pro Pallet Eye Shadow has all the colors needed to paint a cat face. Define features with black shadow cake using a wet tipped brush. Apply to brows sweeping up to create stripes, line into cat eyes, define tip of nose down to center of where lips begin, and down onto center of chin. 5. Set foundation and lids with sheer face powder (see kit or face powders). 6. Contour eyes with brown shadow/Define 1 through crease. 7. Lift and warm eyes with brown shadow to define and terracotta/Balance on eye bone. 8. Use the light shadow/Highlight on inner lid and under brow. Use white pencil in between lines inner eye corner and outer eye corner. 9. Apply false lashes and one coat of mascara to top and bottom lashes. 10. Create stripes with alternating brown/Define 1, terracotta/Balance in between black/Drama and white lines/White Pencil from brow.